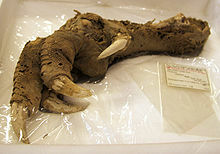 ^ Worthy, Trevor H. Mummified moa remains from Mt Owen, northwest Nelson (PDF). Notornis. 1989, 36 (1): 36–38. （原始內容 (PDF)存檔于2007-10-27）. ^ McCulloch, Beverley. Unique, dark olive-green moa eggshell from Redcliffe Hill, Rakaia Gorge, Canterbury (PDF). Notornis. 1992, 39 (1): 63–65. （原始內容 (PDF)存檔于2008-10-18）.